I treasure my good friends. I also happen to treasure chocolate and marshmallow. Apparently I’m not alone. 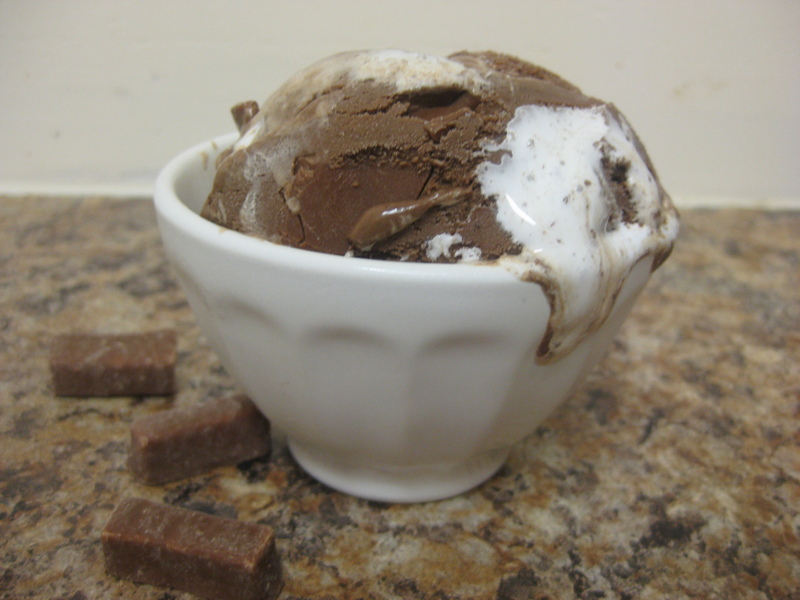 When I first told my friends that I was making Charleston Chew Ice Cream they responded with “OMG do you know how much I love charleston chew? Especially frozen?!? !” or “Wow, that’s a blast from the past, haven’t seen those in a long time…Didn’t canteen sell those?” and my personal favorite “That’s camperrific”. I’ve been wanting to do a canteen-inspired ice cream for a while, you know, complete with all the chazzerai that we filled our bellies with for 10 consecutive summers at Camp Ramah (henceforth affectionately referred to as the best place on earth). But, alas, my friends and I couldn’t agree on the perfect flavor. My favorite canteen order included 2 pizza bagels, a strawberry sundae (totally melted by the time it arrived at my bunk), a package of Rollos and 100 grand. Putting all that into an ice cream seemed disgusting. So instead, I’m going to be creating numerous camp-inspired ice cream treats, to pay homage to the 10 amazing summers I spent with some of my closest friends in the world. Don’t tell The Husband – he might get jealous, but I am having a love affair with Camp Ramah. No matter how much I try to move on, I simply can’t. There’s something about camp that gets under your skin and into your blood – and it stays there forever. The friendships formed, the bonds created, and the life lessons learned, cannot be replicated elsewhere. There is some sort of magic in the air at Camp – a widespread feeling of love that is truly palpable. Simply put, Camp Ramah is the best place on earth. In case all this anecdotal evidence hasn’t convinced you that Ramah is amazing, get a load of this: Huffington Post ran an article this week about the merits of none other than CAMP RAMAH! Camp, the author argues, “is serious business and serious fun commingled to great effect.” The point of a camp experience like Ramah, is to foster in each individual the values of community and Jewish identity. Each day, in a natural and seamless way, campers are filled with pride about their unique individuality, as well as their cohesive binds as a community. It is without a doubt that Camp Ramah is the place where I found my community. This pride and identity, built by Camp Ramah, and further instilled at home, has shaped my adult life and strengthened my core Jewish values. Camp truly is the nucleus of my Jewish identity. It just so happens that ice cream also happens to be a core part of my identity. So it follows logically that this ice cream is camp inspired. This flavor was conceived a few weekends ago when six of my friends were together celebrating a friend’s bridal shower. After all the festivities were over, we took a trip to Jaxson’s ice cream in Ft. Lauderdale. This old fashioned ice cream parlor offered nearly every flavor and topping you could imagine. Sitting in the booth with my girls I was immediately transported back in time. We were 15 years old again, arguing over what ice cream flavors to choose. Flash forward, and you have 4 grown ups, 5 scoops of ice cream and 5 toppings. Some things never change. So here’s to two timeless treasures: good friends and happy memories. Dig in! Whisk together the four egg yolks with the sugar until it becomes pale yellow and thick, and the sugar is nearly dissolved. Meanwhile, heat the half-and-half and milk on the stove top. 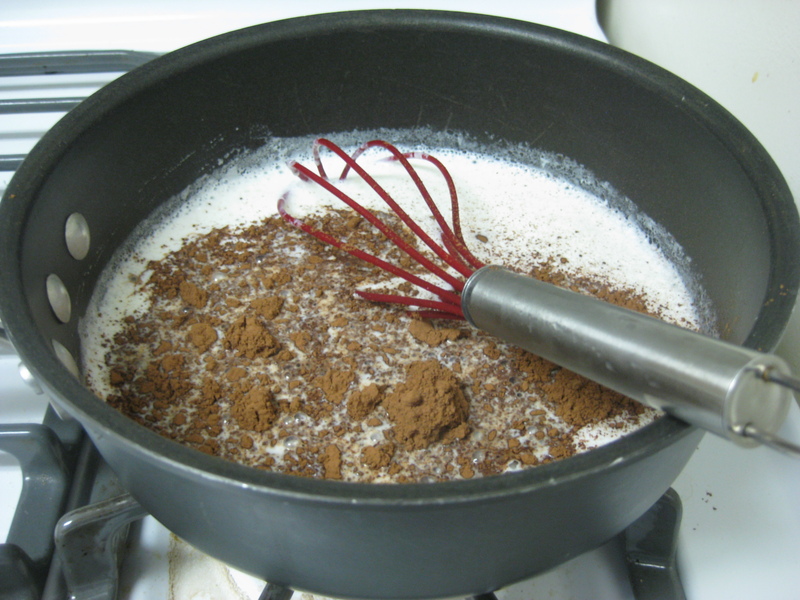 As small bubbles start to form around the sides, and it reaches 170 degrees F, add in the 3 chocolates (unsweetened, semi-sweet chips and cocoa powder) and whisk until fully integrated into the milk mixture. Remove the mixture from the heat and slowly pour into the egg yolk mixture, whisking along the way. Ah ha! You’ve now tempered the eggs. 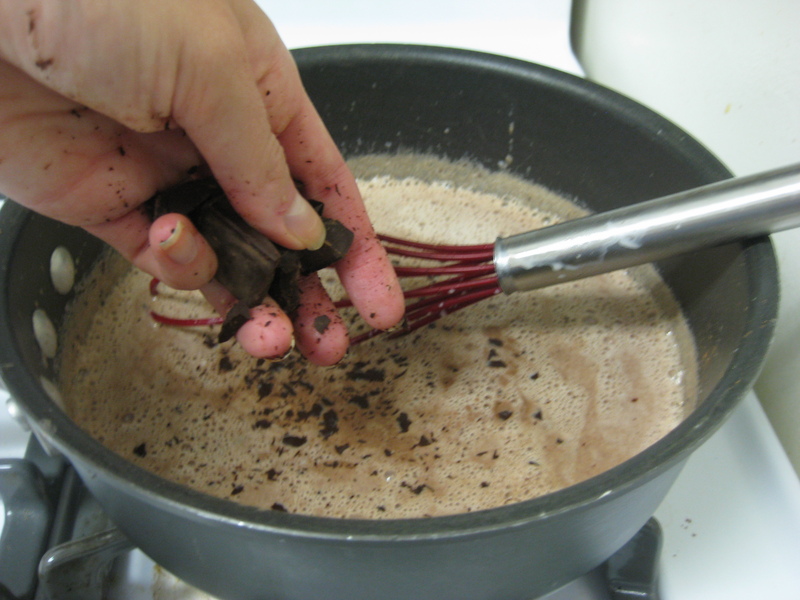 Spreading the melted chocolate -- about to create chocolate chips! Pour the mixture back on the stove top and heat slowly until it reaches 185 degrees (at which the eggs will be fully cooked and safe to eat). Again, remove from the stove and let cool to room temperature completely before refrigerating for 2 hours or overnight (I refrigerated overnight). 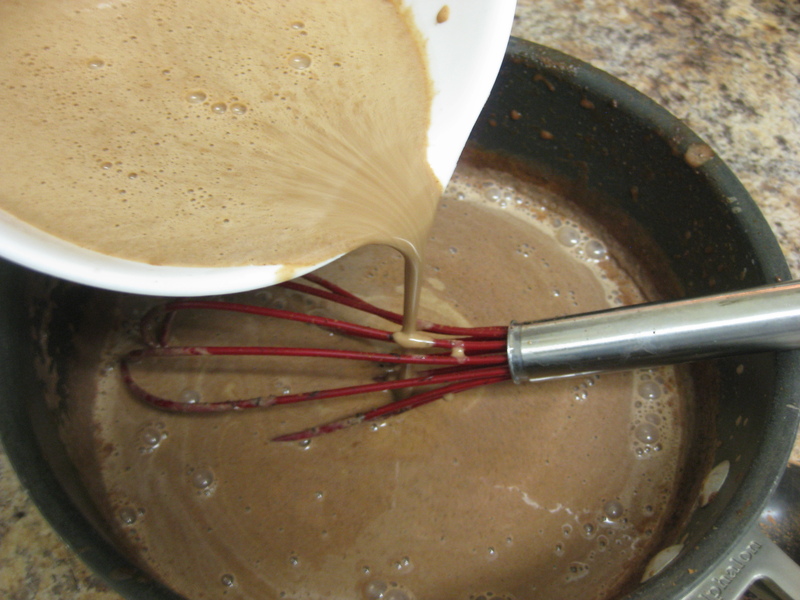 While the mixture is cooling, melt the chocolate for 15 seconds in the microwave, stir, and heat again for 15 more seconds. Repeat until the chocolate is melted completely. 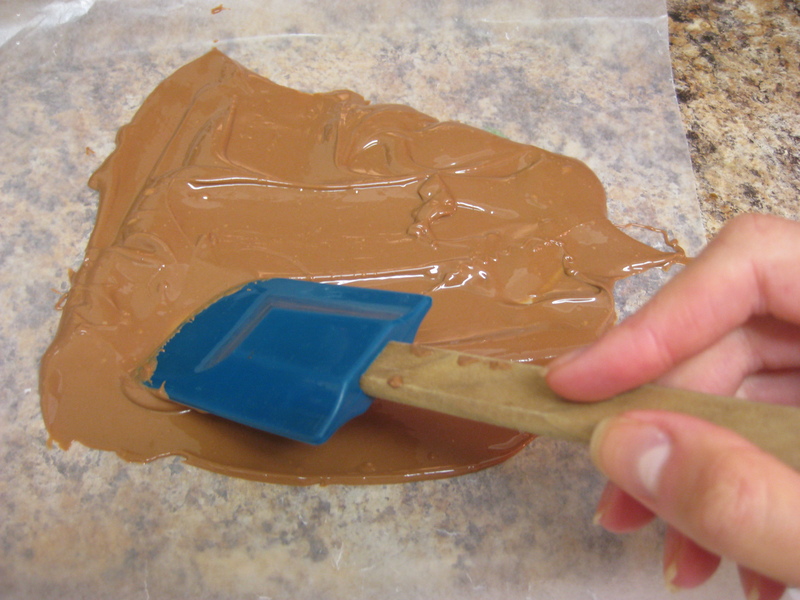 Pour onto a wax paper sheet, spread with a spatula into a thin layer and refrigerate for approximately 30 minutes. 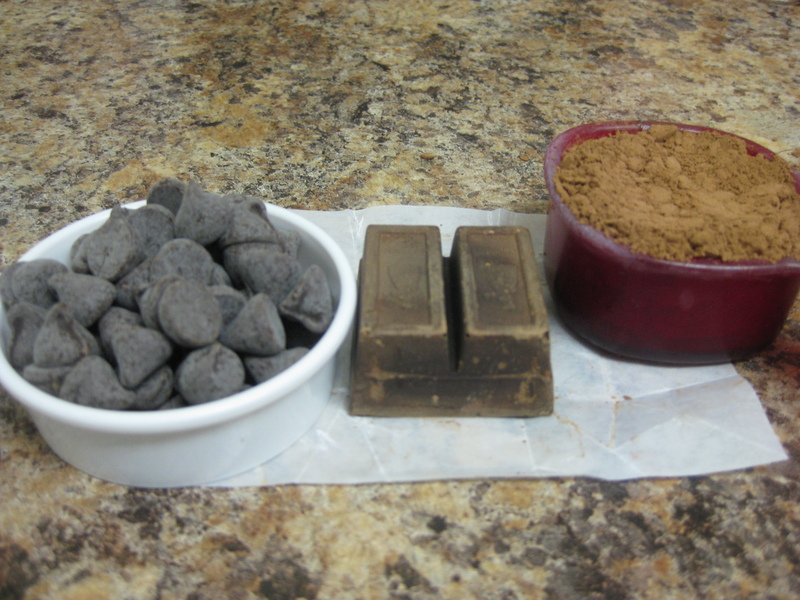 Right before you are ready to use, break the chocolate into small pieces/chunks. You’ll use this later on. 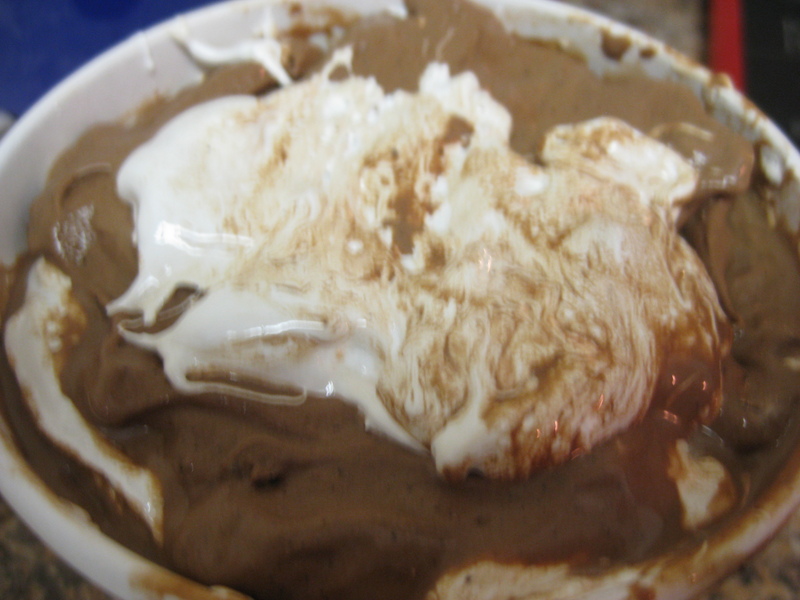 Once the ice cream mixture is completely chilled, pour into the bowl of an ice cream maker and churn according to the manufacturer’s instructions. Approximately five minutes before it’s done churning, sprinkle in the chocolate chips, let the mixture churn, and sprinkle in some more. Repeat until all the chips are mixed into the ice cream. 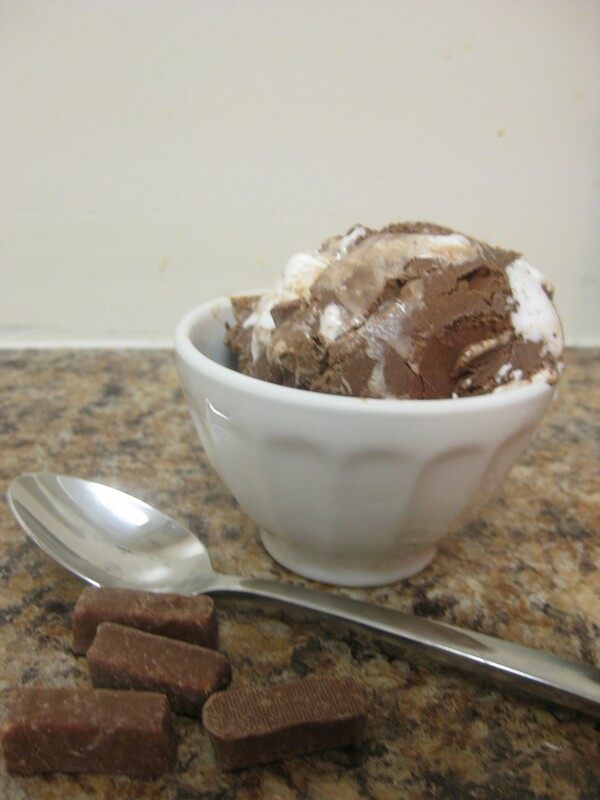 Once it’s done churning, you’ll begin the marshmallow layering process. Spread a hefty scoop of fluff on the bottom of a freezer safe container. Scoop ice cream on top. Repeat until the container is full – at least 6 layers. Top off with more marshmallow and freeze for at least 2 hours before serving. Cheers! To good friends and great memories. 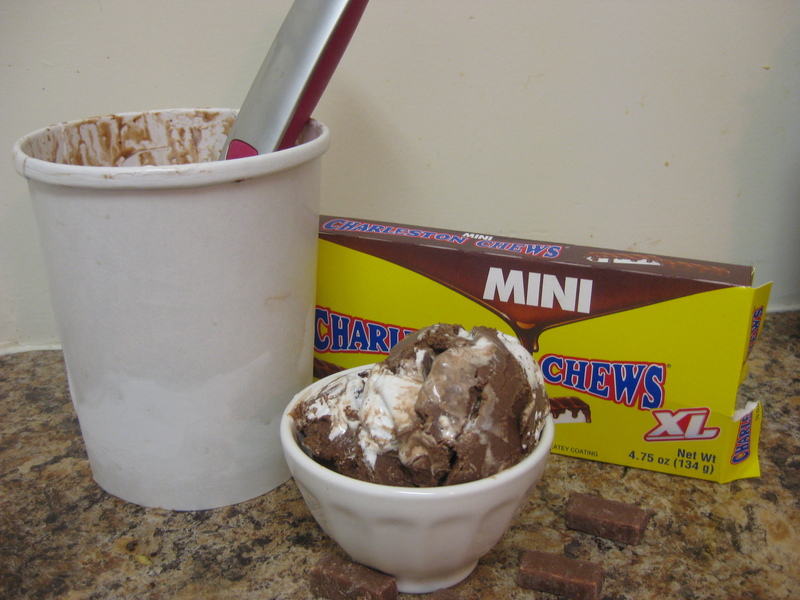 When you’re ready to eat, scoop ice cream into a bowl and sprinkle with a few mini Charleston Chews. Enjoy! Love it! Love EVERYTHING about this blog post – flavor, CAMP RAMAH IN NEW ENGLAND, memories – everything! I also like that my FB post about the Charleston Chew made it in – it might not have been your “personal favorite” (ha ha, just kidding) – but glad it made it! GO 365scoops! GO Charleston Chew! GO canteen! GO Ramah! Go “THE WIFE”! (That’s you because I know you are not disclosing your name). Most delicious ice cream ever. Best memories ever. We are so lucky to all have eachother and Camp Ramah was lucky to have us!!! Yumm Charleston Chews.